For two years or so, I have gone from full on digital guru amongst my friends to the largest proponent of analog gear. It started with my first fountain pen, then a second, then a third. My equipment continued to grow so much so that is seemed obvious for me to begin sharing my experience of these writing tools. 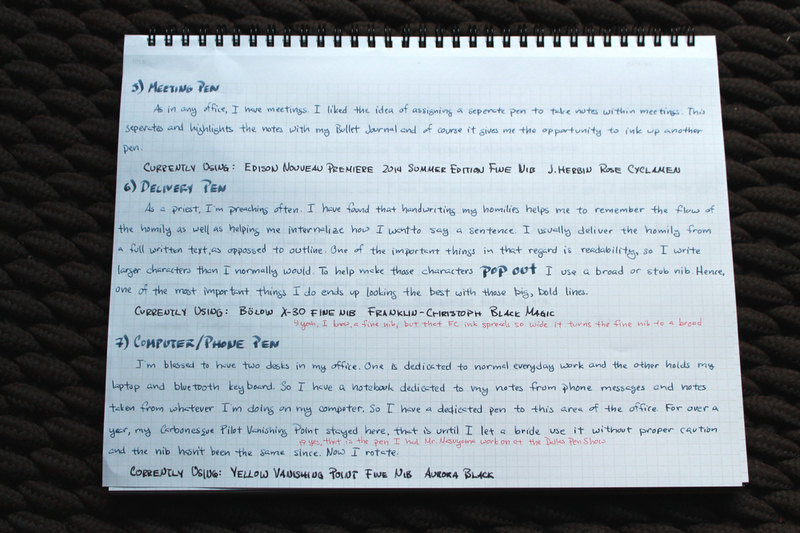 It seems appropriate that, before I continue with other topics like reviews or other creative endeavors, I share should with you how I use my pens paper, and ink on a daily basis. Today, I will start with my fountain scribal workflow. This has different connotations in different areas of the internet world. For me, it is the two pens that are always with me, sitting in my breast pocket ready to be used at a moment's notice. Around the time I started in regular ministry as a priest two years ago, I started carrying around a fountain pen in my pocket. For about a year that was just one pen, the Monteverde Jewelria Mini, with a fine nib. I lost one and purchased another and lost it as well. It still is one of my favorite pens, but I couldn't stand losing another so I haven't purchased a third. For nearly a year now, I have been rotating my daily carry fountain pen. I have a few requirements for this particular pen in my scribal workflow. First, it must have a fine nib because my normal handwriting is small, and the fine nib works well on all assortment of paper, qualities good and bad. Second, it needs to be durable. I don't want a pen in my pocket that can't handle an accidental fall. Thirdly, it needs to be insulated. What I mean by that is in the South and due to my body heat a pen close to my chest can evaporate into the cap the water component of the ink, leaving the dye alone in the feed, which make things difficult to clean. Pens with cartridge converters or sacs are preferred over piston fillers. Finally, it can't be too large because some the clerical shirt manufacturers make shallow breast pockets making it difficult to hold something like a TWSBI VAC 700. About eight months ago, I was convicted by someone (I don't remember who) that fountain pens are not the best in all situations. So I began carrying either a ballpoint, rollerball, or gel ink pen in my shirt pocket as well. This leaves me with two pens on me at anytime for any occasion. I have one pen that is never rotated and is always in use. 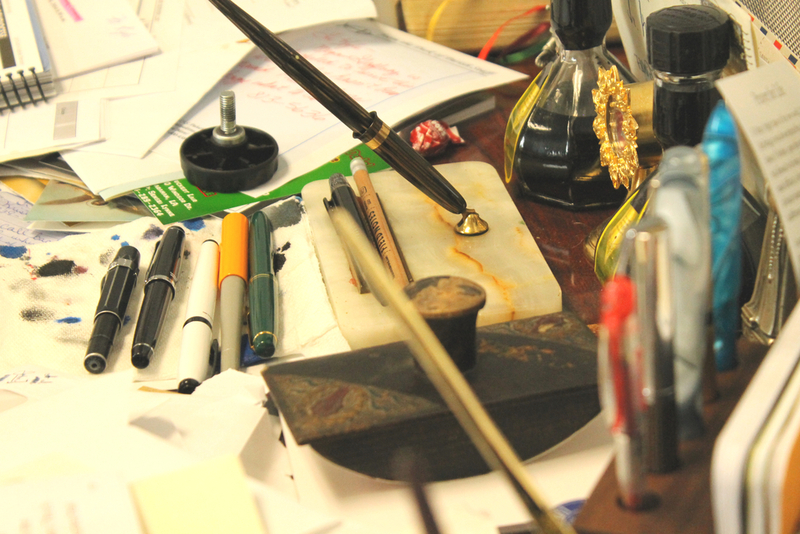 That is my Sheaffer Triumph Desk Pen. I purchased it on eBay for a steal of $30. It has a gold nib and write a fine somewhat boxy line. I use it as my main creative instrument as I'm preparing my homilies. It takes down all my thoughts and seems to organize them in a cogent pattern. It is definitely one of my favorite pens, and so is always in use. This describes not a species of pen, as above, but rather its use. This pen rotates as ink is used up (I don't like to waste ink.) It's role in my scribal workflow (sorry, I love that phrase!) is to man all normal pen duties at my desk: signing checks, free-writing, Bullet Journaling, brainstorming, note taking, letter writing. I am very grateful to have generous parishioners, and so I find myself regularly writing thank you notes. That regularity seemed to warrant a dedicated pen. This role requires a stub or italic nib for pretty characters. As in any office, I have meetings. I like the idea of assigning a separate pen to take notices within a meeting. This separates and highlights the notes within my Bullet Journal and of course it gives me the opportunity to ink up another pen. As a priest, I'm preaching often. I have found that handwriting my homilies helps me to remember the flow of the homily as well as helping my internalize how I want to say each sentence. I usually deliver the homily from a full written text, as opposed to an outline. One of the important things in that regard is readability, so I write larger characters than I normally would. To help make those characters pop out I use a broad or sub nib. Because of this, one of the most important things I do end up looking the best with those big, bold lines. I'm blessed to have two desk in my office. One is dedicated to normal everyday work and the other hold the later technology, the phone and my laptop with its accessories. I have a notebook dedicated to my notes from phone messages and notes take from whatever I'm doing on my computer, and a notebook always needs a pen. For over a year, my Carbonesque Pilot Vanishing Point stayed here, that is until I let a bride use it without proper caution and the nib wasn't the same (yes, that's the pen I had Mr. Masuyama work on at the Dallas Pen Show). Now I rotate when ink runs out. Most of my fountain pens remain in my work office, but I assign a pen a month at a time to reign as my home fountain pen. It is used all over the house, but sits at my desk. I have a third office at the high school where I have been assigned as chaplain. Last year, I dedicated two pens each with one of the school colors (yellow and green) to that office. I didn't think it could get any better than day one, but now that I had scoped out everything. I made a game plan for day two. - get a Ryan Krusac pen. I started the day with my Hawaiian shirted buddy. He had sold one of his nice pens and had already replaced it with a gorgeous Visconti Divina. He allowed me to test the nib and try out a pen, that for me at least, would be out of the question. It reminded me however of the day before. I had spotted another grail pen of mine, the Visconti Homo Sapiens Crystal. He and I got to talking about that pen, about Visconti Dreamtouch Nibs, and he let me know that our now mutual friend Lisa Vanness had one in stock at her store in Little Rock. The pen costed a bit more than the Dolce Vita, but I decided it would be worth the extra expense, because I probably wouldn't get one otherwise. After our conversation (he might have sold me on it) I was determined to get the Crystal. On my way to Lisa, I stopped by the Edelstein's table. The elder took me through their bargain boxes and I found three pens for $60. One was for a friend (can't reveal that because he hasn't received it yet). One was an old Sheaffer Calligraphy pen, and the final was a lesser know German pen called Geha, who made neat little piston filler pens. All three pens were great little buys. The Geha is surprisingly smooth. The Edelstein's bread and butter, though, were vintage Parkers in good condition. I haven't reached that level of collector. I moved from them to Ms. Vanness. The previous day was a good day for her, and overnight her husband had driven from Little Rock to deliver more ink. They are the only American retailer of P.W. Akkerman ink and people flock to her to get the bottles before they're sold out. She confirmed that she had the pen at the store and ... I bought it. I actually bought it. I never though I would go for such an expensive pen, but I found myself giving her my money. I got a bottle of Diamine Mediterranean Blue to compliment the pen. 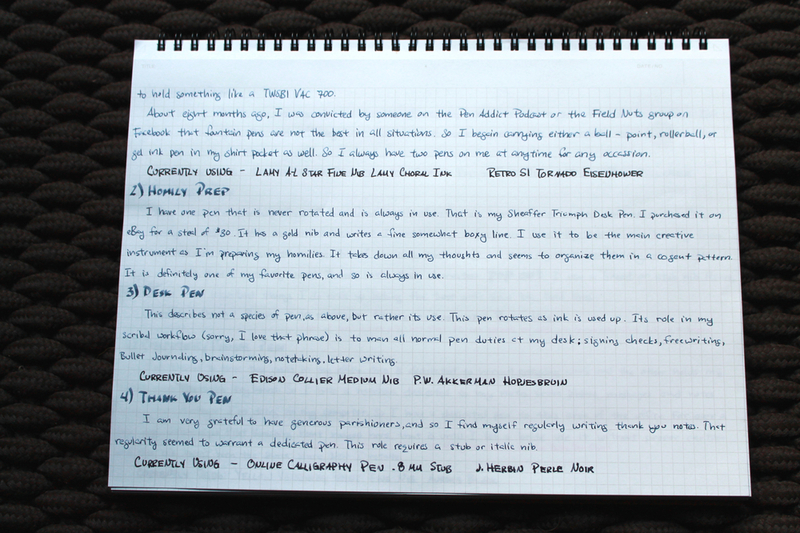 The ink would be the celebratory ink of a new stage in the fountain pen journey. I'm afraid this might have opened a door to getting a Nakaya. Unfortunately, that purchase ruled out the possibility of a getting one of Shawn Newton's pens. However, he had this really cool pen that was mostly black, with a marbled black and white grip that brought you a nice surprise when you uncapped the pen. I told him if he could get a yellow and black material I would buy that pen. So, hopefully, if you continue reading, you will eventually see that on the blog. I had already made up my mind to get a pen from Ryan Krusac. Ryan, from the Atlanta area, turns pens made of rare woods and of harvested naturally shed elk antler. The elk antler pens were especially beautiful due to the scrimshaw work in them. Over the two days, Ryan and I shared some things about our lives, and we even had a connection of a particular crater lake north of Lake Granada in Nicaragua, that for him held special significance. We have some good conversations about mission trips. The first day, there were three of his pens that stuck out to me. I told him I would sleep on it. The one I decided on was the scrimshaw one depicting a ship in a tempest, which reminded me of Scripture and the Sea of Galilee. It has a good weight to it due to the metalware but as I quickly found out it suffers the smudge of inky fingers, so I will have to be very careful with it. It is definitely a display pen, but I don't buy a pen that won't be used. Ryan came to the show accompanied by his best friend, who is a chocolatier. He paired some of his chocolates with some of Ryan's pens. Although I didn't go that route, he had some delicious flavors of chocolate: French Roast Coffee (which brought me back home in an instant), Irish Stout (it felt like biting into Guinness), and Mango with chili pepper. I definitely got some. I ended my floor purchasing at the Anderson's. I wanted some silicone grease to convert the Franklin-Christoph to an eyedropper. I had also eyed a notebook on their table I could use for NANOWRIMO this year that had nearly 400 pages. It's an Italian company called 360° and supposedly it can be bended every which way. I will definitely put it through the ringer in November. Finally, at the very beginning of the show, while the Anderson's were still setting up, I noticed one of the new pens from Pilot, the pocket pen E95. I love pocket pens and at the price with a gold Pilot nib I couldn't pass it up. You might notice there was one thing left on my original list, a special edition Retro 51. Retro didn't have any on display at their table, but they did donate two to the silent auction which benefited the Dallas Pen Club and the continuation of the show. One was an old Retro 51 Abbondanza. The appeal of this pen was its box which is made of bamboo and displays the pen nicely when opened. The other pen was a special edition of 200 pieces the Double 8. It has a gold trim and tortoiseshell celluloid with eight facets. It seems to me very Omas-like, and definitely fits Retro 51's slogan "Life is too short to carry an ugly pen." I was able, with some bid lurking, to win both pens. All in all, I felt my first show was a success. I got some pens, but more importantly I made some new friends. The whole quarry. The Abbondanza is on the left. The Double 8 is on the top. The E60 is on the bottom. Welcome to my newest online abode, Reverenced Writing. It was not my intention to start this blog off with my thoughts on the Dallas Pen Show, but that is what has happended. I had heard about pen shows before and I was excitd to experience one. The place of the Cowboys and George W. Bush seemed a likely market for fine pens. I found the Dallas Pen Club, who hosts the show, to be a vibrant pen community with 30 or so active memebers with total memebership being towards 90. It also helped to have a local pen company like Retro 51 sponsor the show. This list was in my mind, but all I can tell you is a list is of no good if you aren't faithful to it, because a pen show, for a pen addict, is sort of like setting a shoe-a-holic in the closet of Imelda Marcos. There is so much to choose from; you just don't know what to choose. There are so many beautiful pens, so many unique objects. Oh, I've only seen this pen in pictures! "Can I pick it up?" I just picked up an $8,000 pen, and no one yelled at me. What is this place of wonder? Am I in a dream? Did you just let me write with this pen which costs more than a used car? Wait they still make that pen? This pen is seriously older than my dad. I felt like a squirrel running around a grove of oak trees. I can't put all the acorns in my mouth! Noooooooooo! Confession: everytime I told someone this was my first pen show they asked the same question, "Are you overwhlemed?" I said "no" every time, but looking back, yes, I was completely and utterly overwhelmed. As I continue along with my story, there grew two interwoven lines: the people and the pens. 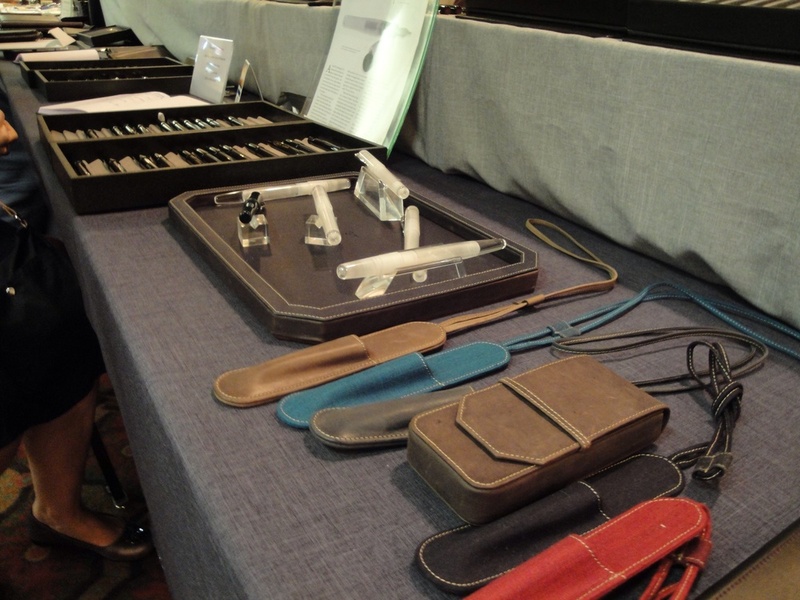 Part of a pen show is the many pens to look at, try, and, for the vendors, hopefully purchase. The other part is the people, the pen community as a whole who have gathered here to proliferate pen culture. So through my story, I hope to share both with you. I started the day in the near manic state explained above. What brought me back down to earth was the people. I met ever so briefly the Anderson's whose podcast I enjoy. I met a nice genletman from Retro 51. I introduced myself to the Little Rock contigent of Lisa Vanness, of Vanness pens, and Shawn Newton, who makes his own beautiful pens. I returned back to them often for great conversation. I also connected with a man whose name I cannot recall, but who wore Hawaiian shirts the whole weekend. He was kind and open enough to share his booty everytime I walked by his table. The surprise though was as I walked into the area where the silent auction was held, right outside the show itself, I saw a familiar sight, a Saints jersey. 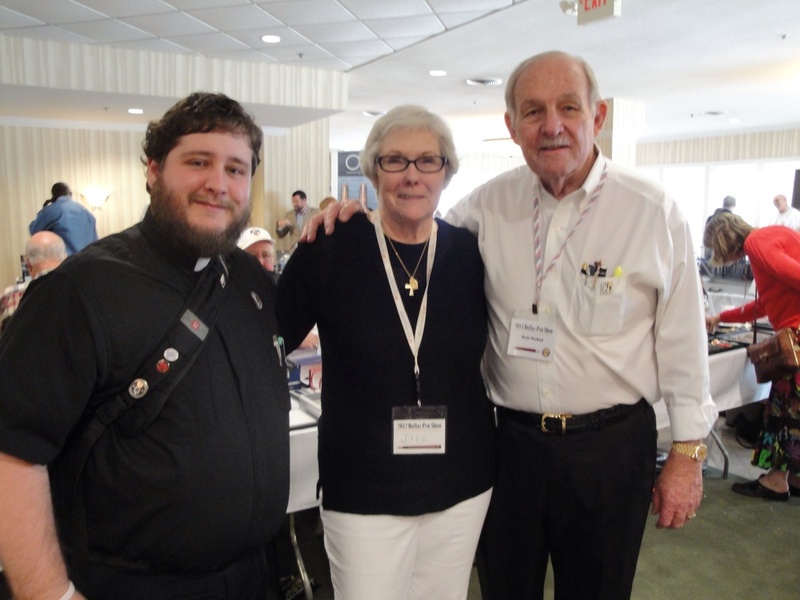 One of the Dallas Pen Club members was originally from New Orleans. She made me feel at home in a place dominated by Cowboys fans. Walking around I found quite a few sellers with Esterbrooks. I found the Franklin-Christoph table. I saw a small number of Dolce Vitas at two different tables. The Dolce Vita has been a grail pen for a long time. The orange reminded me of close images of the sun, dynamic, luminescent, and untameable. Then I picked up the pen and, despite its attractiveness, it had eveything that turns me off to a pen. It was too wide for my small hands. It's grip wasn't terribly comfortable. It's girth and weight outweighed its beauty and price. So it moved from a grail pen to if-I-win-the-lottery pen. So early on the in the first day, I had this freedom of budget that took me searching. What will replace the Dolce Vita? At the beginning of the day, I signed up in Mike Masuyama's line for him repair some of my pens. I had been gifted a Montblanc 146 which was evidently from the 70's or so, but had a replacement cap. It wouldn't write. My first Vanishing Point had suffered the fate of a heavy handed newbie, whom I had lent the pen to, and who had written with it as if it were an ornery ballpoint. The page turned Jackson Pollock and the pen never wrote the same. Finally, I had an Aurora that wrote dry, too much so for my tastes. Mid-afternoon, Mr. Masuyama ressurected these pens into working order. I also had a Parker Challenger I had purchased from a friend that had a misaligned nib. Next to Mr. Masuyama (he had already left by the time I took the above picture), a gentleman named Danny Fudge was repairing older pens. He graciously realigned the nib in under a minute for no charge. While I waited my turn to see Mike, I passed by the Franklin-Christoph table. They had a whole case filled with tester pens. I tried out quite a few nibs and settled on Mr. Masuyama's needlepoint nib. I had to decide whether to go with the pocket sized Model 40 or the regular sized 02 Model in the ice color. I found I preferred the larger of the two pens. It fit better in my hand. I also picked up another for a friend with the 1.5 mm nib. Scott Franklin himself tuned both nibs to perfection. The deal was capped off with a notebook and an extra nib, their new music nib. After Mr. Masuyama's nib wizardry, I roamed around going into deeper research on the available Esterbrooks. Quite a few tables had them at varying prices, so I dove deeper into the colors and the nibs. I was attracted to the ice-blue or blueish purple color with ripples. As for a nib, I was hoping for their accounting nib, but certainly would settle for anything fine. Here is where the fountain community both humbles and amazes me. I got talking with a lady, Jill, who had traveled with her husband, Dr. Bob, from Oklahoma. He had amassed a collection and was selling some of it. Much of his table was covered with Esterbrooks. We got talking about life, faith, and pens. He asks me which color I like. We search through the the table for the bluish color. We find our quarry, so he asks what nib I would enjoy. I said, "Something firm and fine." The nib already installed fit those parameters, but he provided another nib just a bit finer than the first. Certainly, they would characterize most of the dealers at the show in helpfulness and kindness, but he outdid himself in generosity. "Take it," he said, "it would be my honor." I am always uncomfortable with such generosity, so I attempted to resist, but to no avail. He gave me the pen and the nib. This is one reason why I love this community, because the community itself is more important the thing that brought them together. The day didn't end there. My fellow New Orleanian invited me to dinner with some of the Dalls Pen Club and the Edelstein's, a father and son duo of venders. I had a great time talking pens, sports, public radio (a topic I was admittedly weak in) and priests who were in the fountain community. It was a great way to end day one and great way to set up day two.